Powerful hand-held acid blaster rifle converts into a 56mm robot action figure with 9 points of articulation. Gun mode comes with a choice of three handles, any of which can be glued in to the mounting point on the figure's back. Option 1 is a standard 5mm post, which is compatible with any figure bearing a 5mm peg hole. 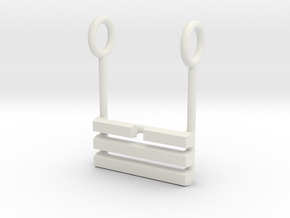 Option 2 is a modified version of the post, which can still be used by figures with 5mm peg holes, but also has a built-in clip which allows it to clip onto any 3mm diameter rail. Option 3 is a two-stage post, which like Option 1, can fit into any 5mm peg hole, but also has a narrowed end allowing it to be used by figures with 4mm diameter peg holes. Newly redesigned hands are able to hold or clip onto any 3mm diameter rod. 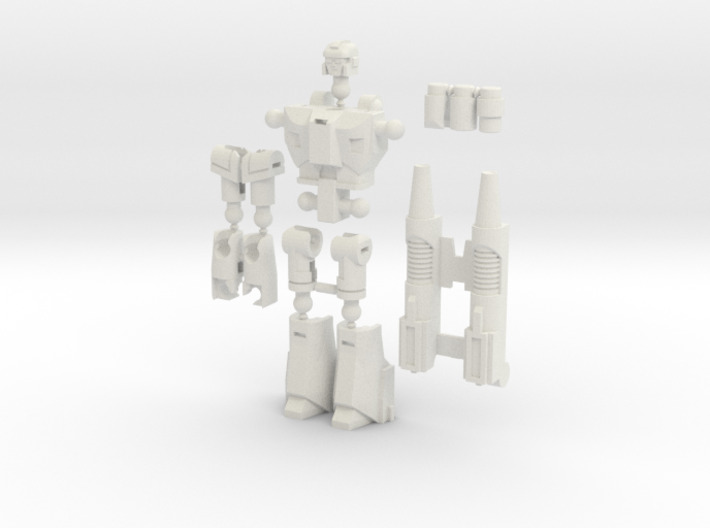 A new hinge design means this figure is now available to be printed in the Detail materials as well as WSF. However, WSF Polished is recommended for the best combination of durability and smoothness. Supplied as a 14-piece kit. Finishing (painting/dyeing) required, alternatively can be purchased in one of the available pre-dyed colours.